Bahrain: US Naval Base or Iranian Asset? What is at stake for Americans in the Bahrain unrest? 1. Bahrain is a major center for the refining of crude petroleum, refining some 270,000 barrels a day. This amount is not large, but given tight petroleum supplies and a price of over $100 a barrel for Brent Crude, an outage there would certainly put up world prices. 2. 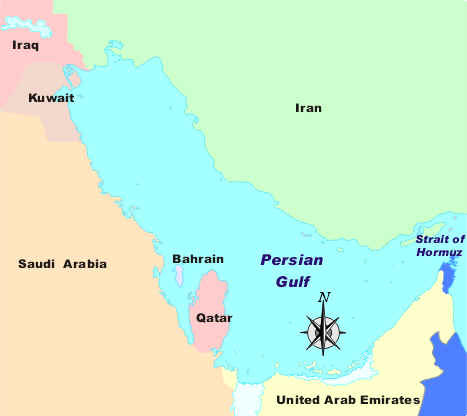 Bahrain hosts a naval base for the US Fifth Fleet, important to the US security architecture for the Persian Gulf (the Arabs say Arabian Gulf). Nearly 2/3s of the world’s proven petroleum reserves and 45% of the world’s natural gas reserves are in the Gulf region. 3. 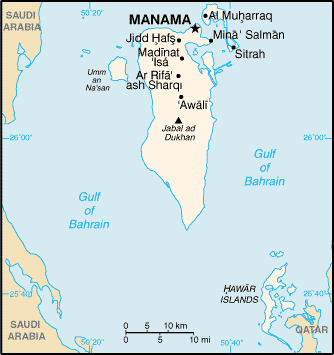 Bahrain is an important finance center. The Shiite majority is attempting to assert itself there. A Shiite-dominated government in Bahrain might well demand a closure of the US naval base. It would not be an Iranian puppet, insofar as Arab Shiites are jealous of their independence and most Bahraini Shiites don’t follow ayatollahs; but it would certainly have warm relations with Tehran. A Shiite victory there would politically embolden other Gulf Arab Shiites, in Kuwait, Saudi Arabia, and the United Arab Emirates (Shiites are a minority in all three). Insofar as Iran enjoys soft power with the region’s Shiites, the net result would certainly favor Iran and at least somewhat disadvantage the United States, which already shot itself in the foot by helping install a Shiite government in Baghdad that has excellent relations with Iran. For the Bahrain government to become more democratic and more Shiite-influenced would annoy the Wahhabi Saudi state, which now sees the Sunni Bahraini king as a strategic asset. Thousands of Shiite demonstrators came out yet again in Bahrain on Tuesday. They are demanding that prime minister Sheikh Khalifa bin Salman Al Khalifa step down. An uncle of the king, Sheikh Khalifa has been appointed PM for four decades. The Shiite protesters want an elected prime minister who would reflect their demographic dominance. The killings of two demonstrators, one on Monday and another on Tuesday, have helped to galvanize the crowds. In an unusual concession, the king, Hamad Al Khalifa, apologized Tuesday for the deaths and promised that the shooters would be brought to justice. The demonstrators thronged into the downtown Pearl Roundabout, and some are insisting on spending the night there. 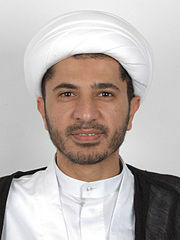 The main Shiite political party, with 18 seats in the lower house of 40 seats, is Wifaq. It suspended its participation in parliament on Tuesday in protest against the killings of the two demonstrators. Bahrain has a little over 1.2 million people, of whom 54 percent are expatriate guest workers, nearly half of them from India. I can remember, on the occasions I was in Manama, the way signs in Malayalam festooned the market and the money-changer stalls. The other 568,000 are Bahrainis. Of these, social scientists think about two-thirds, or about 374,000, are Shiites. In turn, about 100,000 of these are Ajamis, i.e. Shiites of Iranian heritage who are now Arabs. The rest are Baharna or indigenous Bahraini Shiites, who mainly adhere to the conservative Akhbari school that does not believe in following ayatollahs. Many of them live in rural villages outside the capital. The other 187,000 or so are Sunni Bahrainis, the community to which King Hamad Al Khalifah belongs. He has reigned as king since 2002 (having come to power as emir in 1999). In the Gulf, typically guest workers cannot vote and don’t have permanent residency or a path to citizenship, though it is rumored that the Sunni monarch, King Hamad Al Khalifa, has bestowed Bahraini citizenship on some expatriate Sunnis in a so far vain attempt offset the indigenous Shiite majority. The Bahrain constitution lets the Sunni king appoint the 40 members of the upper house of parliament. The lower house also has 40 members, and in the 2010 election only 18 of them were captured by the Shiite religious party, Wifaq, led by cleric Ali Salman. The other 22 went to Sunnis of various stripes. So, in a country where citizens are probably two-thirds Shiite, Shiites have little representation in the senate and are a minority even in the elected lower house. Not only can the Sunni-dominated upper house veto measures passed by the lower house, but the king himself can veto legislation at will and can prorogue parliament whenever he likes. Many Shiites in rural areas are poor, despite Bahrain’s riches, derived from its small petroleum industry, its vital finance sector, and strategic rent from the US for the US naval base for the Fifth Fleet. Wifaq not only seeks more equitable representation for the Shiite majority but also a better economic deal for the poor.